I had noted that antiaromaticity in cyclopropenium anion is lessened by the system adopting gross geometric distortions, which take the anionic lone pair out of conjugation from the ring. Similarly, cyclobutadiene can form a complex with the guanidinium cation in which the anti-aromaticity is reduced by the formation of strong C…H-N hydrogen bonds. Unhappy with modelling a cation without a counter-ion, I added one. I noted that the cyclobutadiene+ ion pair was more stable in this more complete form. My next connection is to a post on how ethyne reacts with peracetic acid. The initial product of this reaction is oxirene, which like cyclobutadiene or cyclopropenium anion is anti-aromatic. This time, the liberated acetic acid forms a remarkably strong hydrogen bond to the oxygen of the antiaromatic ring as a way of reducing the antiaromaticity. Particularly noteworthy was that the initial attack of oxygen on the alkyne was very asymmetric. This reminded of another post on the reaction of dichlorocarbene with ethene, which too is asymmetric, yet again to avoid an antiaromatic transition state. However, as the hydrogen bond in 4 above get stronger, the antiaromatic oxirene becomes symmetrical again. It is as if the hydrogen bond had replaced the need for asymmetry (as with 2 above). Another asymmetric example is the 2+2 closed shell cycloaddition of two ethenes, which adopt a different form of distortion. The original alkyne+peracid study was conducted using a gas phase model. I decided to revisit it now, but to change the modelled medium from the gas phase to continuum water. I show the IRC (intrinsic reaction coordinates) for this reaction in continuum water followed by the gas phase below (click on the animations to see the transition state model). I want to compare the difference that introducing a model solvent (water) has made to the appearance of the reaction path. In water, the symmetry of the forming antiaromatic oxirene ring is always maintained. There is no distortion; the combination of hydrogen bond, developing ionicity and its stabilization by the model solvent, appears to eliminate the need for such distortion. The free energy barrier, ΔG‡ (ωB97XD/6-311G(d,p) is 32.2 kcal/mol, outside of a room temperature reaction. In water, the proton transfer step comes much later, and is visible in the RMS gradient norm at +1.4. In the gas phase, the IRC is much more complex (as previously noted). Pronounced asymmetry develops, and this only resymmetrises late on, when the hydrogen bond forms. In the gas phase, the proton transfer occurs relatively early, and it cannot be found as a discrete feature in the RMS gradient norm plot. 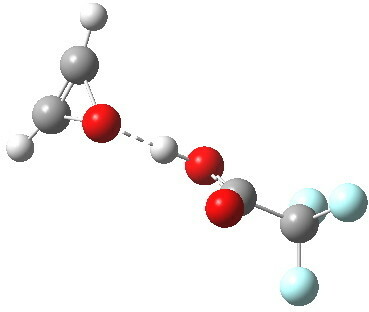 If a more acidic peracid is introduced, say CF3CO3H, and the reaction is again simulated in water, the proton transfer is further delayed (below), and the barrier drops to ΔG‡ 25.9 kcal/mol, an entirely viable thermal reaction. I do not believe this particular variation has ever been tested experimentally; anyone up for it? The product of the CF3CO3H reaction is shown below. It has a remarkably short predicted hydrogen bond of 1.55Å between the oxirene and the trifluoracetic acid. The take home message is that the very nature of a reaction, the geometry (symmetry) of the molecules taking part, and the timing of the changes can be very visibly changed by simulating the event with a solvent. In the past of course, all such computational studies were conducted purely as a gas phase model. Postscript:The above shows how even a change in continuum solvent can affect the features of the reaction path. A rather greater perturbation is to change e.g. the substituents on the alkyne. I have tried replacing one H with t-butyl, and the other with OH. The rationale for the former is that t-butyl acetylene is actually the substrate that this reaction has been performed on, and for OH that it pushes electrons into the oxirene, making is more anti-aromatic and hence more liable to avoid that antiaromaticity. Animation of the IRC for this combination is shown below. Notice how the reaction now proceeds in a concerted manner directly from the alkyne to the hydroxy-carbene, without any sign of an intervening oxirene. The energy and gradient profiles for this variation are shown below. Notice in particular how the barrier has dropped; it is now a much easier reaction. This entry was posted on Monday, July 9th, 2012 at 8:58 pm and is filed under Uncategorized. You can follow any responses to this entry through the RSS 2.0 feed. You can leave a response, or trackback from your own site. This example nicely illustrates a very important point that using only gas-phase calculations or making only single-point corrections for solvation free energy may be highly misleading. Things are just too different in vacuum: intermolecular interactions are exaggerated, charge separation is hindered, etc. So, the potential energy surface may have very different profile, and even the wavefunction character may change: I’ve seen open-shell singlets, stable in the gas phase, collapsed in continuum solvent. I begin to think that if the system one works on is in solution, everything should be done with continuum solvent model applied. Fortunately, unlike not too long ago, there are some very robust implementations of continuum models available out there. Warts and all, it’s still better than doing calculations in vacuum. This of course brings a contentious issue of doing vibrational frequency calculations with PCM-type models and using them to get thermodynamic data, a truly heretic idea for some researchers. Although I think I do understand their logic, form the experience we’ve seen many times that it works fine.